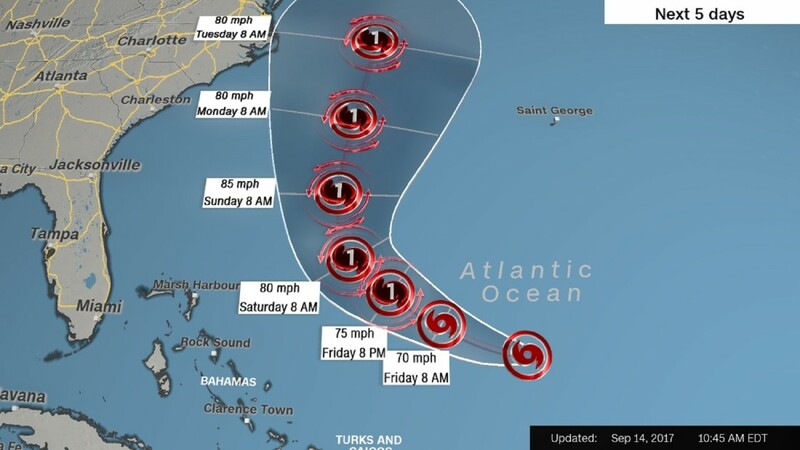 (CNN) The so-called cone of uncertainty for Tropical Storm Jose now includes North Carolina’s Outer Banks, Maryland and Delaware, after the National Hurricane Center on Thursday shifted its potential path west. The cone shows the probable track of the center of a storm over a five-day period. With maximum sustained winds of 70 mph, Jose is a tropical storm after being a hurricane through the week. The storm is expected to strengthen and become a hurricane again by this weekend, the center said. At one point last weekend, Jose was a Category 4 hurricane. Jose, which recently completed an odd clockwise loop, is forecast to move closer to the United States before turning north. 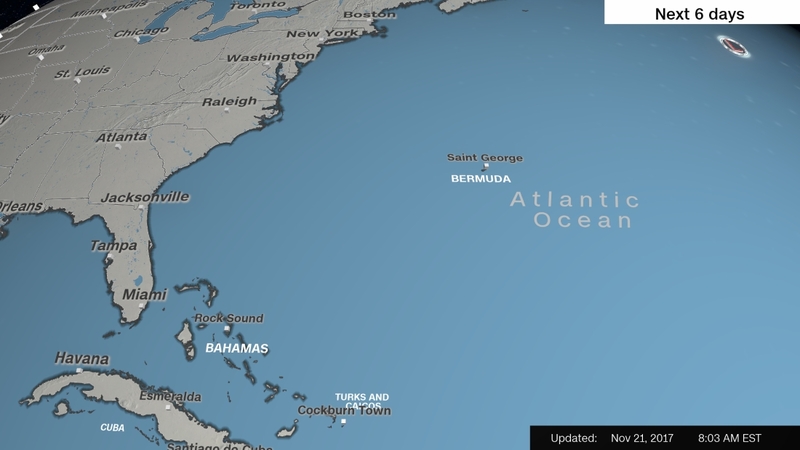 The vast majority of computer models still keep the storm out to sea, but a few show it making a potential landfall along the East Coast, CNN meteorologist Brandon Miller said. “Jose could produce other direct impacts next week along portions of the east coast of the United States from North Carolina northward to New England, but it is too soon to determine what those impacts might be or where they could occur,” the hurricane center said. The inclusion of the Outer Banks in Thursday’s advisories marked the first time the United States mainland has been in the forecast cone tracking Jose. As of 11 pm on Thursday, Jose was in the southwest Atlantic Ocean, about 375 miles northeast of the southeastern Bahamas, and was moving west-northwest at 8 mph. No matter its path, Tropical Storm Jose is expected to bring rough surf and rip current conditions in the next few days. The swells generated by Jose are affecting Bermuda, the Bahamas, the northern coasts of Hispaniola and Puerto Rico and the US Southeast coast. Those effects will spread north along the mid-Atlantic coast in the next few days. Jose is the sixth named hurricane of the Atlantic basin season, which lasts through November. The peak of hurricane season is generally from mid-August to mid-October. Two major hurricanes, Harvey and Irma, have hit the United States, with Irma also demolishing islands in the Caribbean.